He’s a unique, visionary filmmaker of his generation. And he really likes Western comic books. 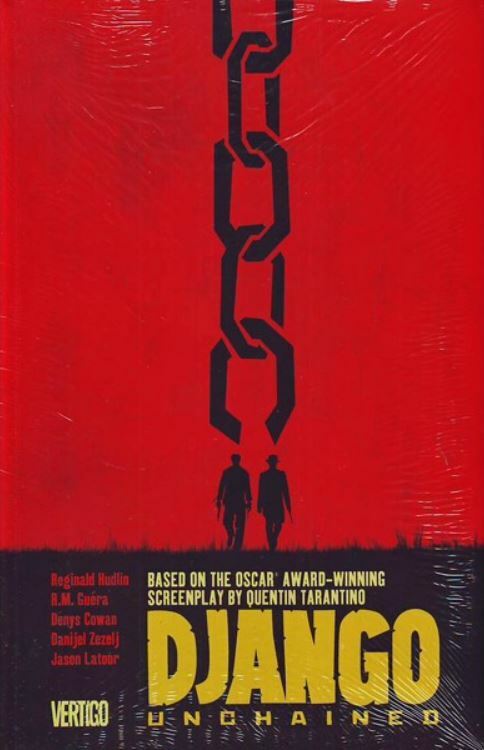 In the foreword to the graphic novel adaptation of his Academy Award winning film Django Unchained, Quentin Tarentino gives credit where credit is due, and why the comic book format is squarely appropriate for a director’s cut of his screenplay–the screenplay that won him a second Oscar for a screenplay after his win for Pulp Fiction. 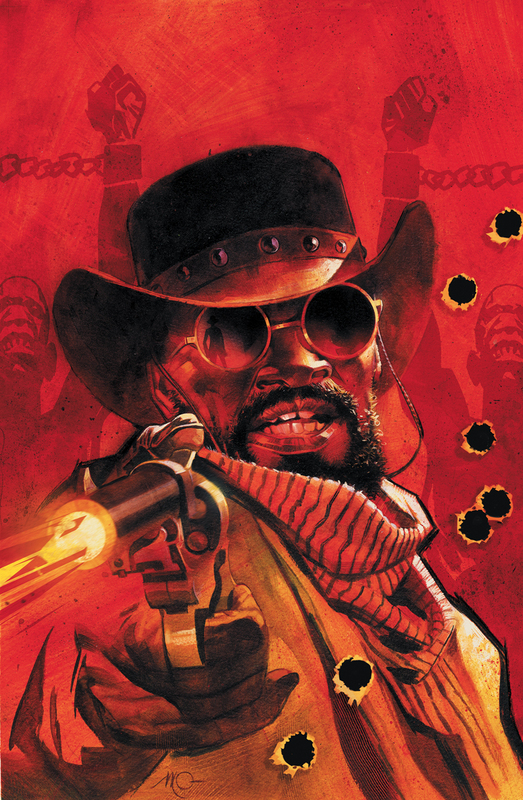 Vertigo Comics’ Django Unchained was originally released last year as a six-part comic book adaptation of Tarentino’s four-hour long, first draft of the screenplay, later spread out over seven issues. It’s a long narrative and by the end of part seven you will understand why editors exist. That said, it’s a good tool for story writers, as his opening scene, measured pacing, and character development provide a window into the creative process of this singular screenwriter. It features an adaptation of Tarentino’s work for the medium by Reginald Hudlin and most of the interior art was rendered by Serbian artist R.M. Guéra (who also served as artist on Jason Aaron’s Scalped) providing his own Western style. 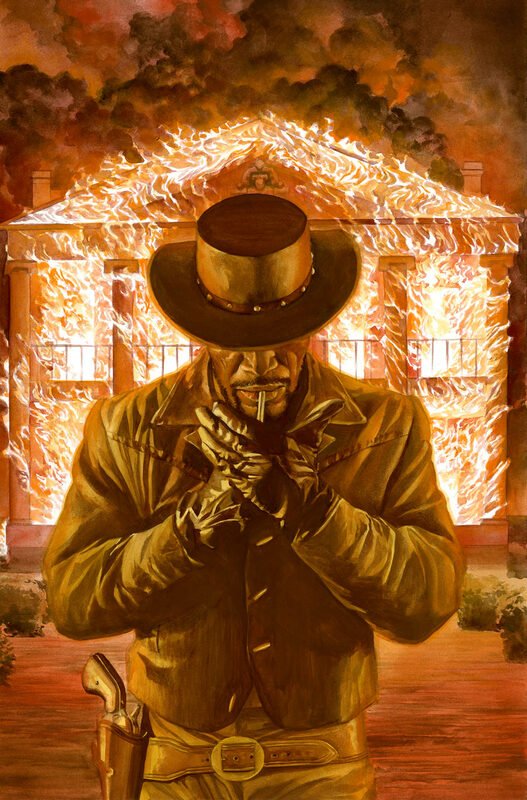 Plenty of covers are featured, too, including one of Alex Ross’s best, Django walking from the burning house, which served as the cover to the final issue. For fans of Westerns, especially comic book Westerns, it’s an excuse to read a unique take akin to Unforgiven or The Man With No Name, whether or not you made it to the theatrical release. As characterization is concerned, Tarentino’s newly freed ex-slave Django, German bounty hunter Dr. King Schultz, and house slave Stephen each have such depth and raise so many questions of motivation, politics, society, and history that film historians will be studying this work for years to come. Simply looking at the parallels of Dr. Schultz with Oskar Schindler could have you up late with your friends at the coffee shop for hours. Django Unchained will be released for the first time as an affordable trade paperback edition this Wednesday, July 16, 2014. You can pre-order a copy here from Amazon.com or request a copy at your local comic book store. Were Django Unchained Tarentino’s last work, he would no doubt go down as a filmmaker unequaled in his generation, with Inglourious Basterds, Jackie Brown, and Pulp Fiction also highlights of his portfolio. But Django Unchained will not be his last Western. One of his next projects is The Hateful Eight, based on a script he already has cast, which included a cast read viewed by the public, revealing key plot points that make it sound like his take on John Ford’s Stagecoach from 1939–probably the greatest Western film ever made. The Western The Hateful Eight will begin filming this November. That cast will include Samuel L. Jackson, Kurt Russell, Bruce Dern, Michael Madsen, James Remar, Amber Tamblyn, Zoe Bell, and Walt Goggins. Oscar winner Christoph Waltz will apparently not be back for this next film after his Oscar-winning work in both Inglorious Basterds and Django Unchained (as Dr. Schultz). Beginning with Kurt Russell transporting Amber Tamblyn’s character in a stagecoach in the post-Civil War era, they meet up with Samuel L. Jackson’s Civil War veteran character and others as they become stranded in Wyoming in winter. The Hateful Eight is loosely connected to a theatrical release in December 2015.